Our specialist wedding dress preservation & dry cleaning service ensures that your bridal gown will continue to look beautiful for years to come. After detailed spotting inspection by the dry cleaner, your gown will be individually cleaned and pressed, and then hand-finished. 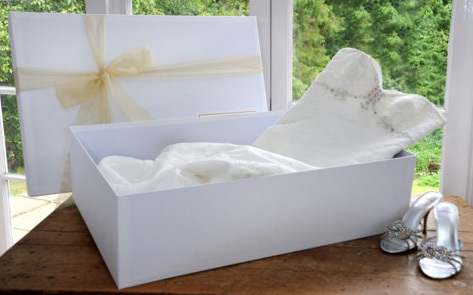 For preservation, we delicately wrap your gown in acid-free tissue paper and place it in a flat, lidded box to protect it from light and dust while storing. Gowns are personally priced on inspection by the dry cleaner on arrival.